Square Enix Ltd., the publisher of SQUARE ENIX® interactive entertainment products in Europe and other PAL territories, today announces FINAL FANTASY® IV: THE COMPLETE COLLECTION will be available across Europe and PAL territories as a Special Edition exclusively for the PSP® (PlayStation® Portable) system from 22ndApril 2011. For the first time, the characters and storylines from FINAL FANTASY IV and its sequel THE AFTER YEARS™ are united in one beautifully crafted adventure. Featuring both classic games and an all-new scenario linking the two together, with enhanced visuals and an extensive Gallery Mode with lavish CG movies and illustrations by Yoshitaka Amano and other respected artists. 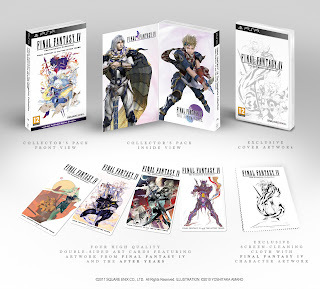 FINAL FANTASY IV: THE COMPLETE COLLECTION delivers the definitive version of one of gaming’s greatest sagas. 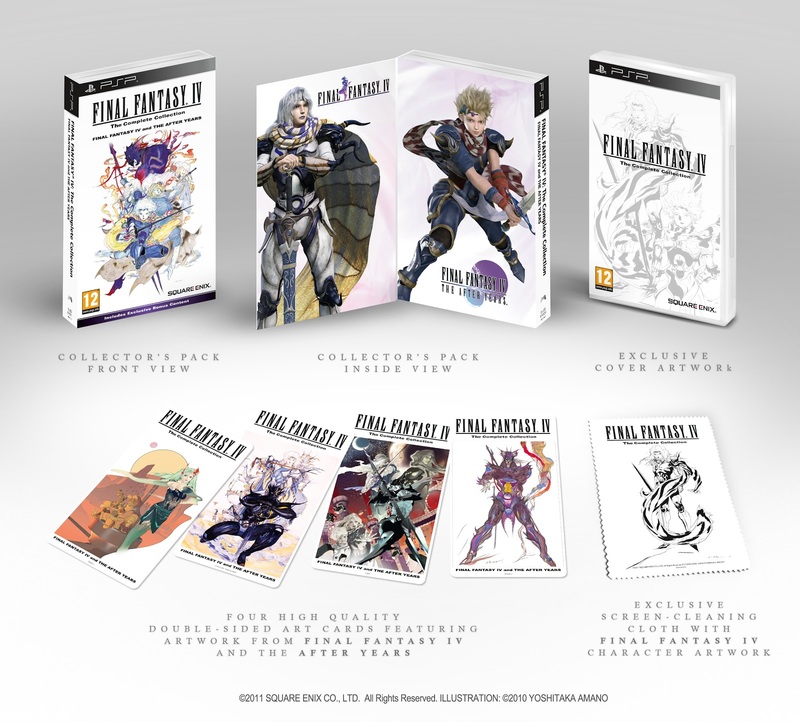 In addition to a copy of FINAL FANTASY IV and its sequel, the special edition, available only for pre-order and at launch, includes a number of exclusive in-pack items comprising high quality Art Cards featuring artwork from FINAL FANTASY IV and THE AFTER YEARS and a screen-cleaning cloth decorated with Cecil from FINAL FANTASY IV character design, all housed in special fold-out presentation box. The pack also includes special downloadable content for use in DISSIDIA® 012[duodecim]™ FINAL FANTASY®, that will be revealed at a later date. The critically-acclaimed and much-loved FINAL FANTASY IV tells the story of Cecil, a dark knight whose quest for redemption leads him into the midst of a battle to decide the fate of the world. More than a decade after its conclusion, his son Ceodore, hero of THE AFTER YEARS, faces a similar challenge – but has he the strength to follow in his father’s footsteps?